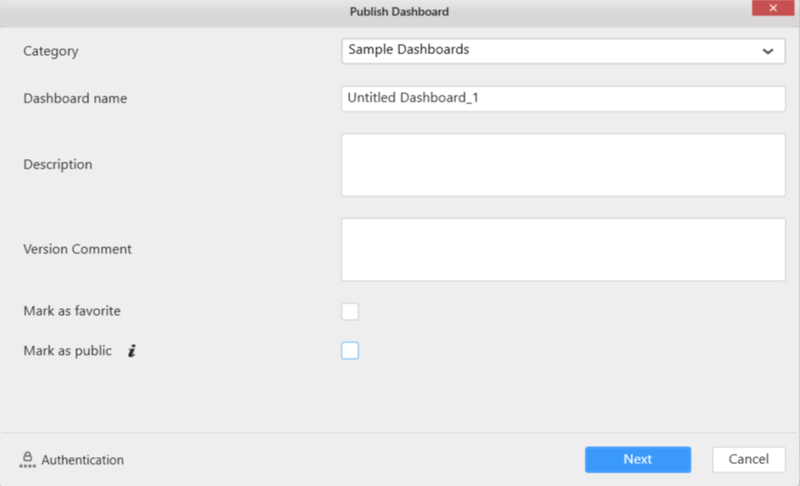 How to publish a dashboard with periodical refresh option for file type data source? Please follow the below steps for periodical refresh of file type data source. Install the Syncfusion Data Agent tool. Please refer the below mentioned documentation about data agent installation process. Design the dashboard with any file type data source (like Excel, CSV, Text, JSON etc…) using our dashboard designer. 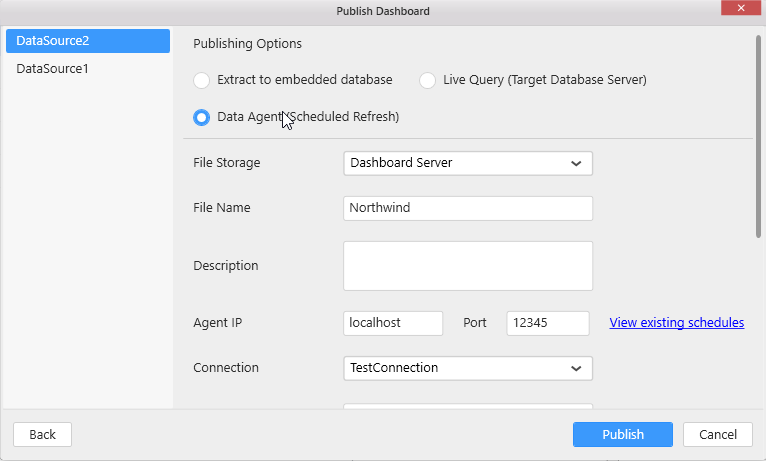 Once the dashboard is completely created, click the “Server” option available in the dashboard designer toolbar and select “Publish >> Dashboard…” from the menu. The below window will be loaded and now configure the dashboard settings accordingly. Click “Next” button and the following window will be loaded. 5. Choose “Data Agent (Scheduled Refresh)” publishing option. 6. Fill all the required fields in the publish window and finally click “Publish” button. Note: Here “Cloud Service” and “File URL” options are available only for `Microsoft Excel`, `CSV`, `Text Document`, `JSON`, `SQLite` and `Microsoft Access` data sources. If you need to configure the schedule refresh (Auto Refresh) for these type of data sources, you must upload the appropriate file into `Google Drive` or `Dropbox` Cloud service. As of now, we can upload the files in Cloud services like Dropbox and Google Drive only. File URL is nothing but the sharable link from the Cloud service. Login with your cloud service Dropbox or Google Drive account. Upload the file which is configured in our dashboard designer manually into the cloud service. You can upload the file here manually every time after insertion and deletion of content into them. For example, insertion and deletion of rows in an Excel sheet. Note: Limitation for uploading file into the cloud service is, you could not change the file name and location while uploading. Below I have provided the details to get sharable link from Dropbox and Google Drive. 1. 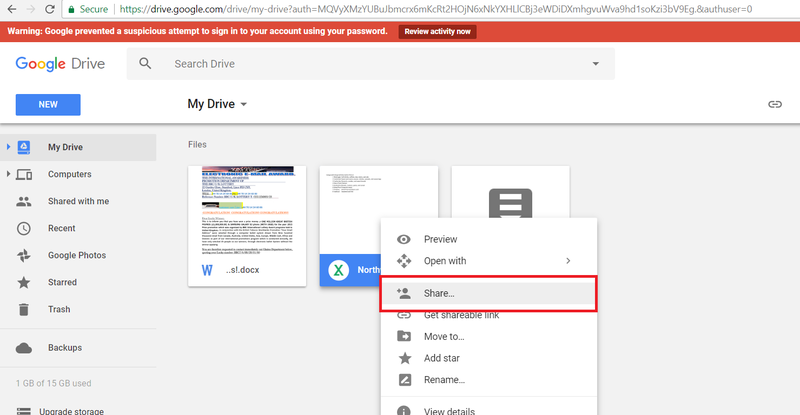 Click on “Share” option besides the uploaded file. 2. 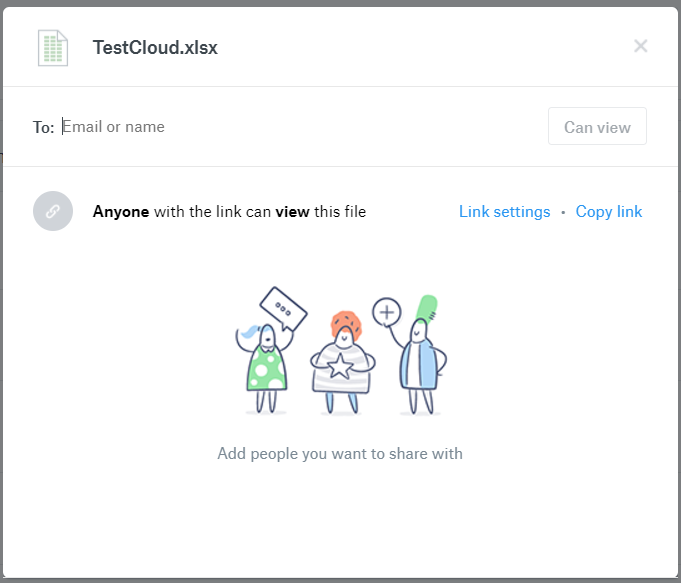 Click “Copy link” and you can get the shareable link from Dropbox. 1. Right click on the uploaded file and click “Share…” option from the content menu. 2. Click “Get shareable link” like in the below image and now you can get the shareable link from the below highlighted part.